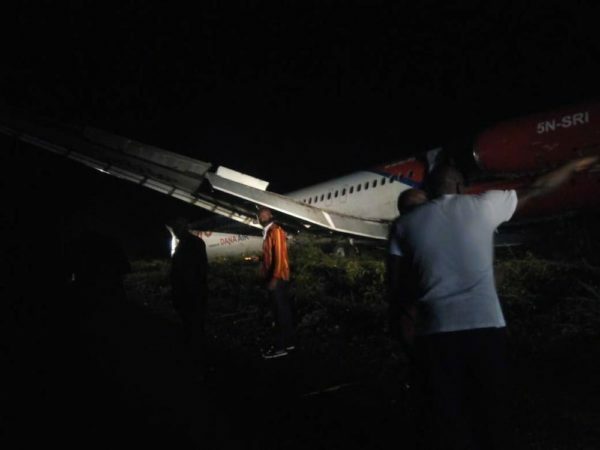 A plane belonging to Dana Airlines overshot the Port Harcourt International Airport runway, skidding off into the bush, Sahara Reporters reports. This is coming a week after passengers of a Dana flight shared stories of an exit door falling off upon touchdown, sharing photos of a gaping hole on the plane. According to Sahara Reporters, the plane took off from Lagos and upon arrival at the Port Harcourt International Airport overshot the runway, skidding into the bush. The photos shared showed passengers being evacuated from the plane in the bush.